If you are leading a business and are responsible for its growth you might always be thinking – What’s next? This ‘what’s next?’ is majorly about futuristic technologies for more than 80% of the businesses and is often preceded by the decision to make a shift. But finding the answer to this three-word question is not a piece of cake. With ever-changing nature of technology, businesses have become way more dynamic. It is paramount to take calculated decisions at the right time to gain an advantage. So how does one take calculated decisions prior making the transit? It is believed that the decision to transit to a particular technology could be a cakewalk if two questions could be accurately answered. When is the right time to shift to next technology? Will this shift help in business growth? To get answers to these questions, first, one needs to evaluate at what growth stage a technology is, and its impact on business. How do you evaluate at what growth stage a technology is in? The answer is simple if you are aware of the technology lifecycle and determining factors associated with each phase. 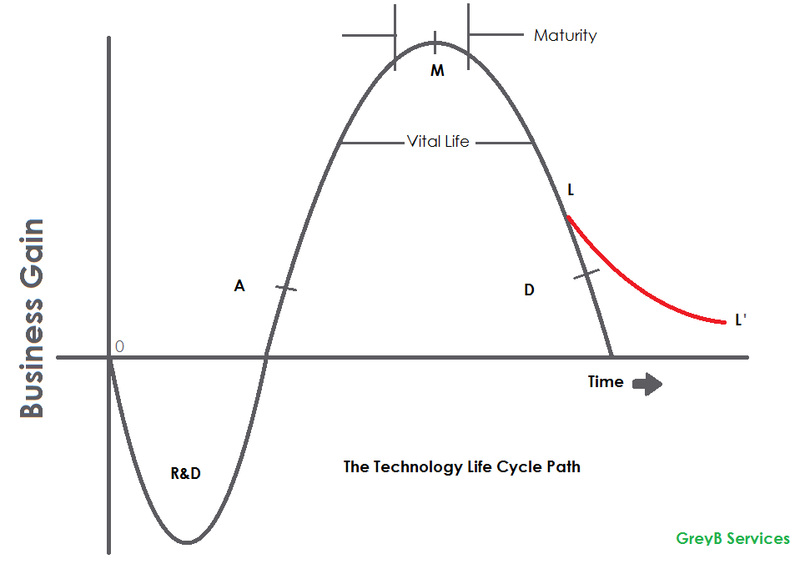 Normally, there are four important stages in the lifecycle of a technology. The decline (or decay phase), after a Point D, of reducing fortunes and utility of the technology. Understanding each phase and taking a decision accordingly could be the stepping stone to success. Instead of going into theory, let us show you around how the shift could be done with the help of an example. A note from the author: In one of my previous articles, I discussed how an R&D team could figure out many complex questions like what to develop next, which technology of yours is in the growth/declining phase, etc. You must read that article here for better understanding: Click here to read. Many companies have already taken advantage of rightly identifying the time to shift, and with their openness to upcoming/developing markets they were able to open new revenue streams. Let’s take the example of well-known tech giant Apple. It entered into music player industry by identifying the need to shift. No need to mention how we see iPod today and how much market it captured. Not only this, they entered into watch domain to further expand the business. 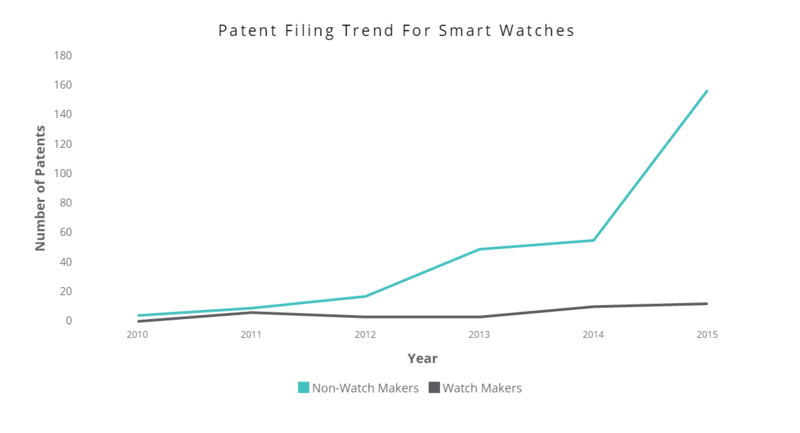 Patent filing in watch domain is stagnant whereas in smart watches the interest picked up around 2008 and research activity increased thereafter. This was the first clue that something is happening in the industry. Now let’s take a deeper look at it and identify which type of companies were giving early fire to it. Before 2012, the innovations in smart watches were led by the watch manufacturers like (Seiko, Casio, and Citizen). Post-2012, the companies of mobile phone domain such as LG, Oppo Mobile, etc. contributed to a great extent in the industry. Also, the big players of the mobile phone world such as Apple, Samsung, Motorola, have a presence in Smart Watch market, but their patent activity is less. It seems big names like Swatch, Tissot, Tag Heuer, etc. started late and are not having much presence in this area. Fossil, for example, started late and collaborated with Intel to penetrate the market. Had the shift been seen and explored by traditional watch makers, they would have captured the market and had the pie eaten by non-watch makers. The huge potential of domain attracted many new companies to enter in last 5 years. The contribution from these companies has risen exponentially. Keeping a watch on such an activity helps take decisions to enter into an unexplored domain. In smart watch domain, an average of 30% rise is observed in the patent filings of new entrants. This is indicative of their rising interest. You might be thinking what more can strengthen your decision about making the shift. It hints about business potential in this direction. One clear indication would be the expansion possibilities. In the smart watch domain, it was observed from the research interest where different applications were covering a smart watch. Most of the inventions focus on an integration of smart watch with other devices. Some of the most important ones include health monitoring features, navigation, and automobile control. Also, the activity gives hints that smart watch may emerge as an important pillar for smart homes for controlling various consumer electronic devices. 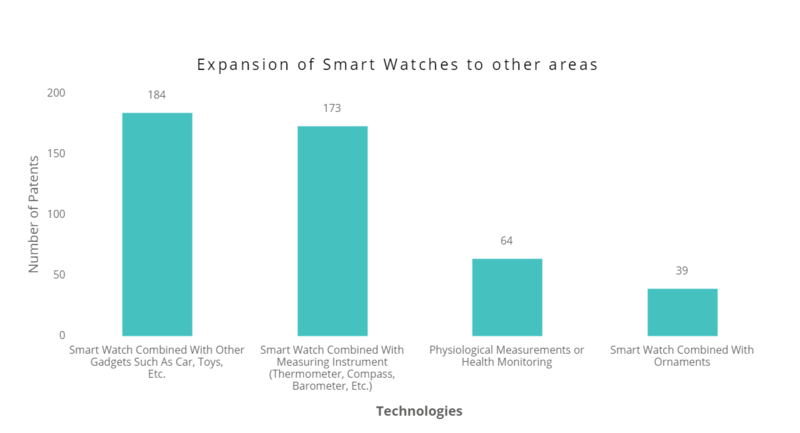 Also, you will find a handful of traditional watchmakers in the top 100 entrants of smartwatch market. Apple alone sold 12 million to 13 million watches in one year. Now you can imagine where this number could go if I consider sales figure of every smartwatch makers. Imagine what Swatch, Tissot, Tag Heuer Fossil could have earned had they been the early movers. This is not the only case where companies lost a big bet, there are many. Ebooks, for example, affected the traditional book market. There are many technological areas where still is time to take action. Smart switches, for example, holds the potential to disrupt traditional switch industry, 3D printing, and many others. If you also want to spot the next technological shift in your business, shoot an email to sales@greyb.com and we will align our next study to your work area.